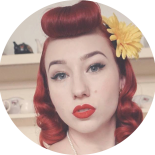 For this week’s fabulous video I have for your a tutorial showing you how to style a faux bettie bang! This style has been long awaiting and much requested so I do hope you find it useful. If you don’t wish to make your own hair rat you can buy either a shaped one, or a donut bun and cut this down to your desire size, they’re available at most chemists as well as discount stores such as Red Dot and The Reject store! If you have any comments, feedback, questions or request please comment below! And if you love what I do be sure to subscribe to my channel as I have new videos coming out every week! More fabulous vintage fun coming real soon! What a great video – thanks for sharing your tips! Ive been looking through your hair tut’s very informative and helpful. Im a hairdresser and its always great to pick up little tricks like your hair rat that id never heard of before. Love the idea. Thank you. This entry was posted on February 26, 2016 by Miss Lady Lace in Pinup, YouTube and tagged 1940's, 1950's, 2016, australia, bettie bang, bettie page, blog, blogger, faux bettie bang, glamour, Lady Lace, miss lady lace, miss lady laces pinup blog, nicole, perth, perth burlesque, perth pinup, perth pinup blog, pin up, pinup, pinup blog, pinup blogger, pinup fashion, pinup girl, pinup life, pinup lifestyle, red lips, retro blog, retro girl, retro glamour, victory rolls, vintage, vintage blog, vintage blogger, vintage fashion, vintage girl, vintage glamour, vintage perth, vintage pinup blog.